Comment font les anglais pour faire tenir leurs mets à base de gelée? Gelatine is a proteique translucent, transparent (even if sometime it's slightly yellow), colourless, odourless substance obtained by prolonged boiling of connectives tissues, bones and skin of animals. It was in the past considered like an additive and possessed number E441 which was wrongfully attributed. We prefer today classify it among ingredients. It's a thermo reversible matter, after mixing it with water it forms a colloidal gel, it means that it's a substance between liquid and solid, with tiny particles in suspension (they had to be inferior at 200nm) to that the mixing is homogeneous. What are the uses of jelly? 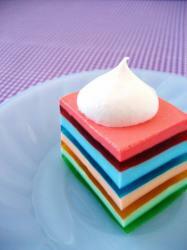 Gelatine is used in many different ways, especially for cooking. Gelatine in form of sheets and gelatine in form of powder which have the same functions, the hydrolysates which don't have the jellifying function but are just used as proteins in dietary supplement and finally the instant gelatine which dissolves already in cold water which is the reason it is used pour cold fares as creams, desserts and cakes. Generally, it serves as binder, stabilising agent or as gelling agent for ice cream, sweets, yoghurts, jams or it is used to make desserts looking more beautiful. Besides it was as well discovered by big food industries because the gelatine doesn't contain any fat. They participate in amputating campaigns and profit of the society that aspires a perfect body. They use thus the gelatine to add volume without adding calories. On top of that the gelatine is added to juices of fruit to clear them. Otherwise it is also used in other industries. It is met in photographic films, in capsules containing medicaments or as gel agent. It is as well used in medicine for drugs and also for munitions, especially for tests of weapons. We know that there are many ways to produced jelly. Notably with gelatin product from fruits : the pectin. Pectin is a substance obtained in lot of vegetables principally in pips or peels of certain fruits. But it exists also an other gelatin product from a familly of brown algae: laminarias, this gelatin is called alginate.